First PMG Paper Money Grading Events in Europe. At first glance, the 2015 Singapore $50 bill looks like an ordinary banknote that could easily be overlooked in an "around the world" bargain box on a coin exchange. But the piece that was sold in a Mavin International auction in November 2018 is far from being ordinary. According to the auction house, this serial number 000001 sold for 552,000 Singapore dollars including buyers’ premium, which is the equivalent to 400,000 US Dollars and more than 100,000 times the face value of the note. 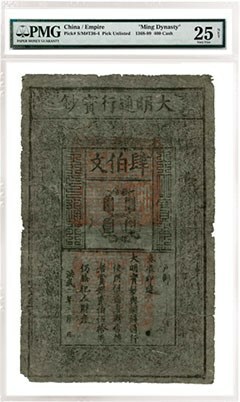 The record probably resulted not only from the special rarity of the strictly limited special edition, commemorating the 50th anniversary of the independence of Singapore, but also from its certification and preservation: The banknote is encapsulated in the plastic holder of Paper Money Guaranty, an independent affiliate of Numismatic Guaranty Corporation. The experts at PMG gave the note a grade of PMG 67 Superb Gem Uncirculated EPQ. With the grading scale only going up to 70, the banknote is almost perfectly preserved. This was PMG’s first "on-site grading" event for paper money, modeled after the four successful NGC coin grading week events that took place in the Munich office in 2018. The PMG grading took place in London between the 21st and 30th of January 2019. A second PMG on-site grading event, this one at the CCG office in Munich, is scheduled from the 4th to the 8th of March 2019. Like the first event, modern and historical banknotes from almost all countries can be submitted, and there is no additional fee for the on-site evaluation. For banknote collectors, this means a significantly reduced grading time, because the results should be available by the middle of March 2019. Anyone wishing to have their banknotes professionally examined during PMG's second on-site grading event can submit them to NGC International GmbH, CCG’s Germany affiliate, by Friday, March 1, 2019. For this purpose, the box 8 ("Munich On-Site Grading") must be ticked on the NGC GmbH submission form. Banknote collectors from the United Kingdom can also hand in their banknotes to the NGC International UK office in London – all banknotes that arrive there by February 22 can be transported to Munich for the grading event. Analogous to NGC's classification of coins and other coinage, PMG's expert verification of banknotes has become the globally accepted standard in the world of banknote collectors. In addition to the actual grading result, the authenticity is of utmost importance. 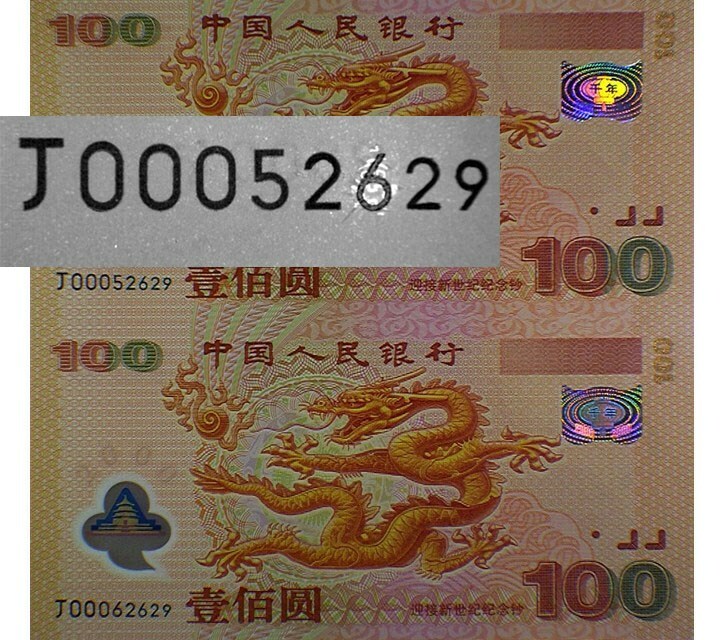 In Chinese banknotes, in particular, lucky numbers like the "8" let the market value skyrocket, while the "4" can hurt the collector value because it is considered an “unlucky number.” Counterfeiters alter the serial numbers on banknotes to make them appear more valuable. Special equipment helps PMG detect an altered serial number, like this one. However, the PMG experts know the craft of counterfeiters and use special equipment to detect such counterfeits. A grade will only be awarded to those notes that can be confirmed beyond doubt as genuine. If so, any PMG-certified grade will be backed by a full guarantee against counterfeits and over-grading. The grading of banknotes is a recent development compared to coin grading in numismatics. Paper Money Guaranty was founded in 2005, while the history of NGC dates back to 1987. Since the beginning of banknote certification at CCG headquarters in Sarasota (Florida), the mission has always been: "PMG offers expert and neutral judgment on the authenticity and preservation of banknotes." The basis for this is the "Sheldon scale," which is also recognized around the world for coin grading and comprises 70 points. For all grading at the 65 level and higher, banknotes receive the "Exceptional Paper Quality" designation, in short: "EPQ." Such a banknote is, in the estimation of the graders, in completely unrestored, original condition. These notes have not received any physical, chemical or other treatment. An "EPQ" may also be issued with banknotes that show traces of wear from circulation. Without the "EPQ" designation, however, a banknote cannot be graded better than "Choice Uncirculated 64." The world-famous symbol for PMG’s services is a high-quality transparent holder, in which the banknotes are inserted after the evaluation process. This holder is secure and tamper-proof, and is specially designed for long-term preservation and protection of notes. The holder has been revised several times since 2005 and has been in its third generation since 2016. It consists of inert material, so that a reaction of the banknotes to the material in the holder does not happen. 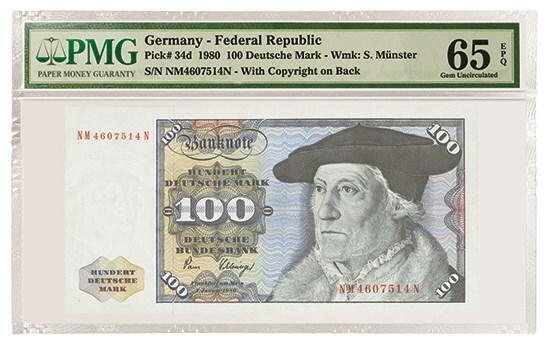 On the label, which is located on an elongated section above the banknote, information such as the PMG grade, the year of issue, the denomination, origin and pedigree (if from a collection) are listed. Banknote collectors can look back on a long and rich tradition: Some of the first paper money was printed in China during the Ming Dynasty. However, it was not before the 18th and 19th centuries that banknotes became everyday means of payment – in part to avoid the use of precious metals in the production of means of payment. 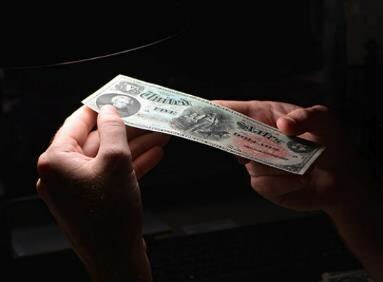 At least since the 1980s, "special effects" have also found their way into the world of banknotes – for example, polymer banknotes or banknotes with holograms for counterfeit security. And with more than 3.5 million banknotes certified by PMG, grading banknotes is now a part of this exciting and everlasting hobby.